I did not have time to stop at the Motte on my first visit to Faughart, so I was delighted to call back. 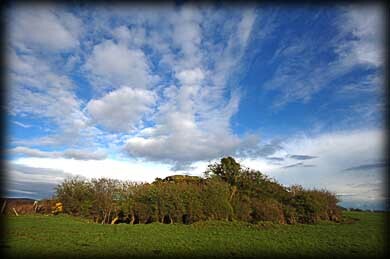 Unfortunately the ditch around this Norman Motte is being used as a dumping ground. 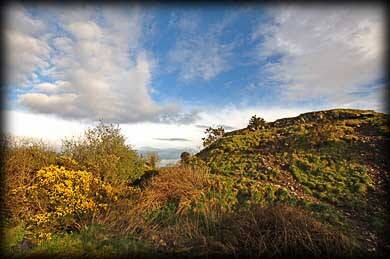 Standing about 8 metres high on top of Faughart Hill the motte offers extensive views of Dundalk Bay and the North East of the Republic, as well as Slieve Gullion in County Armagh. It is quite a large mound probably 15 metres in diameter at the top, but the sides are collapsing slightly. There is said to be an entrance to a soutterrain near here also. If you are visiting the graveyard on Faughart Hill then drop by here, but I could not recommend going out of your way to visit this Motte. Situated: From the Grveyard on the hill walk about 100 metres further up the hill to a sharp right turn. The motte is in the field to your left through the gate. Discovery Map 29: J 056 126. Last visit February 2011.